David Leslie is congratulated by team-mate Billy Steele after scoring Scotland's second try against England. After ten minutes at Murrayfield, Scotland supporters could be forgiven for fearing the worst. The game had barely begun when Ken Plummer, sidelined by England for the past seven years, swept outside his marker Dave Shedden with ease and raced to a brilliant try – only to be pulled back for placing a foot in touch en route to the try line. After six minutes, England breached the Scotland line once again with Alan Old putting Andy Maxwell over as the visitors cut right through the Scottish defence. Old converted. With confidence already low, it was difficult to see how the Scots would recover from such a bad start, even with another 74 minutes left on the clock. At half time, England held a three-point lead, but by then there had been more than a glimmer of hope for Scotland in the shape of a thrilling try scored by Alan Lawson, created by Shedden with help from the pack. Shedden collected a wayward cross kick and matched Plummer’s trick by surging outside Old and into space, to put Scotland on the attack. Seven players in navy blue rampaged towards the try line, chased by just three white shirts, and the ball went through the hands of Mike Biggar, Sandy Carmichael and Alan Tomes before Lawson was released at the 22 to provide the finishing touch near the posts, beating Plummer’s despairing tackle. Murrayfield erupted. Scotland were back. The Queen meets Scotland captain Ian McLauchlan before the match at Murrayfield. Suddenly, a fixture which had generated more apprehension than anticipation at the Scottish Rugby Union was looking a lot brighter than had been predicted. The arrival of the Queen before the match had not provided the diplomatic incident that had been feared, with Scottish nationalism at its 1970s peak, although the situation had required skilful choreography, and the help of the rugby establishment in the West Stand. “The strong lungs of thousands of rugby supporters in the stand at Murrayfield on Saturday saved the Queen, accompanied by the Duke of Edinburgh and 11-year-old Prince Edward, from open embarrassment as the now traditional chorus of whistles and boos from the terraces greeted the national anthem,” reported The Scotsman. “Extra police on the pitch kept the 70,000 crowd in their places before the Calcutta Cup match started. Palace officials had been apprehensive at the reception the Queen might receive, but as she stepped on to the field with the Duke of Edinburgh to meet the players, she was greeted with a roar of welcome. By half time, the Royal visit had been forgotten, and attention was fixed firmly on which side would carry momentum into the second half. Each had lost a winger, Scotland’s Dave Shedden departing with concussion “after bravely confronting the vastly superior tonnage of Andy Ripley” but only after executing “an absolutely classical cover tackle” on England wing David Duckham, whose match – and England career - came to an abrupt end at that moment after his hamstring gave way in the impact. This time the backs sent Lawson in for his second try which clinched an eventual 22-12 victory, with Billy Steele, Andy Irvine, Ron Wilson and substitute Jim Renwick combining to send the scrum half “through a gap in the English defence about the size of the Mersey tunnel”. Scotland captain Ian McLauchlan pauses ahead of a scrum with fellow forwards (from left) Alan Tomes, Alastair McHarg, Gordon Brown and David Leslie. The celebrations began, but not everyone was convinced that this Scotland side had turned the corner, with the coach and the captain remaining under pressure. Ian McLauchlan may have grinned like a Cheshire cat as he clutched the Calcutta Cup, but he was probably less thrilled to read, two days later, that it was time to put him out to grass. 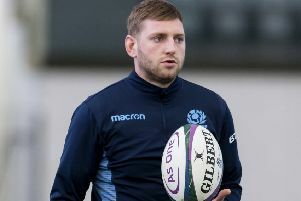 “If the selectors have already determined that they will not get another season out of him, then he should surely go now,” wrote Mair, at a time when Scotland still had one match to play in the championship, the rugby writer going on to suggest that Mike Biggar would be a good choice for captain. Scotland scrum-half Alan Lawson dives over the line for his first try, with England winger Ken Plummer unable to stop him and Scotland captain Ian McLauchlan in support. As it turned out, McLauchlan kept his place, and the captaincy, bowing out three years later after captaining Scotland against the All Blacks. The real casualties of that afternoon at Murrayfield were two of English rugby’s legendary figures, Duckham and Ripley, who did not play for their country again. The latter could consider himself extremely unlucky, being “jettisoned at his peak”, according to the official history of the Rugby Football Union. Several others found that their international careers lasted only that one season, as wholesale changes were made the following season. Only Alistair Hignell, Peter Wheeler, Fran Cotton and Bill Beaumont survived the cull to line up in the 1977 Calcutta Cup. In the heat of the moment, England captain Tony Neary describing the victors as having been “disruptive, feeding on mistakes and mostly only throwing the ball hither and thither when it had already gone loose.” By the end of the championship, the table suggested there had been more to England’s fate than troublesome opponents, as four defeats out of four ensured the wooden spoon’s stay in the Twickenham trophy cabinet was extend to a third year. Alan Lawson lines up a tackle on England's Andy Ripley, in full flight. England centre Andy Maxwell evades the Scotland defence to score the game's opening try. Dave Shedden and Andy Irvine combine to stop an England attack. England winger Ken Plummer makes a break, with Ian McGeechan alongside and Alastair Cranston in pursuit. With Sandy Carmichael making the introductions, Prince Edward meets Ian McGeechan and the rest of the Scotland team.